The Bi-color 8x8 LED Matrix Driver Module from jolliFactory is not designed for use on just a specific micro-controller board but for the general micro-controller boards out there. Above shows an assembled Bi-color LED Matrix Driver Module with the LED Matrix not installed onto it yet. Arduino micro-controller board is one of the most popular microcontroller boards currently used on a wide variety of projects and there are lots of Arduino shields which are boards that can be plugged on top of the Arduino PCB to extend its capabilities. 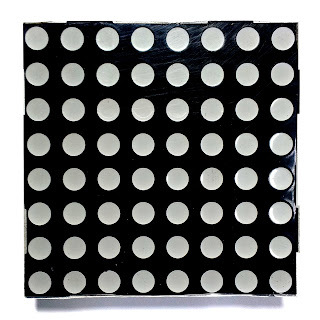 Use of shields dramatically reduces the number of interconnect wires needed on most projects which is great during prototyping. 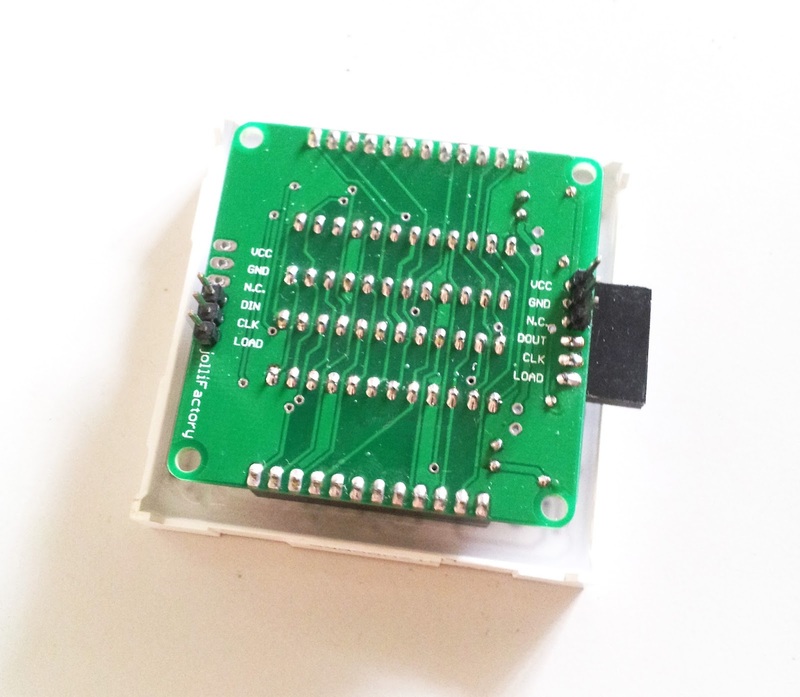 Our Bi-color 8x8 LED Matrix Driver Module is not designed to be an Arduino shield but we will show you how to adapt it to mount on Arduino footprint-compatible boards to control it directly without use of interconnecting wires. The jolliFactory Bi-color 8x8 LED Matrix Driver Module comes as a kit. Assemble the LED Matrix Driver Module Kit according to the youTube video below but leave out the steps to solder the J3 female angle header and J4 male angle header. 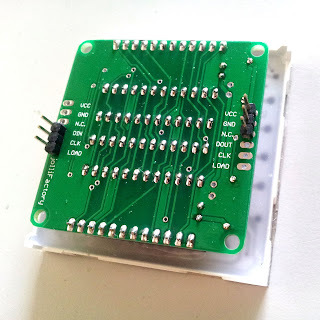 Instead of the J3 female angle header and J4 male angle header, solder a 3 pin male header at J3 VCC, GND and N.C. (Not Connected) and another 3 pin male header at J4 DIN, CLK and LOAD as shown in the picture below. To mount the LED Matrix Driver Module on any Arduino footprint-compatible boards, align the J3 header pins VCC, GND and N.C. with the Arduino board’s POWER header pins labelled as 5V, GND and GND respectively and J4 header pins DIN, CLK & LOAD pins with Arduino board’s DIGITAL header pins 7, 6 and 5 respectively. Below shows a LED Matrix Driver Module mounted on a chipKit UNO32 Arduino compatible board. If you intend to daisy-chain more Bi-color LED Matrix Driver Modules to the mounted module, you will need to solder another 6 pin female angle header at J3 of the mounted module as shown below. The pins for VCC, GND and N.C. on this female header will need to be trimmed and solder applied to bridge the pins with the corresponding pins on the 3 pin male straight header at J3. 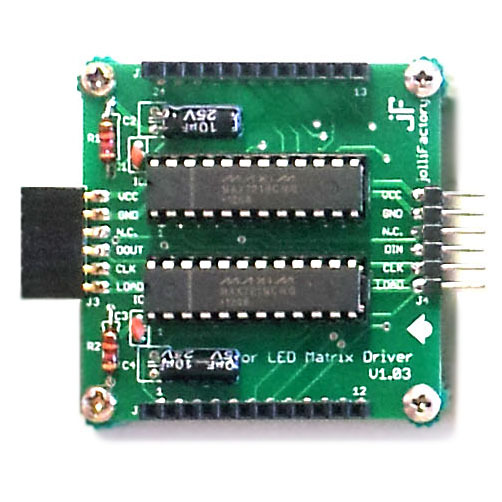 See the following YouTube Video on how the Bi-color LED Matrix Driver Module is mounted on a Arduino footprint-compatible board and daisy-chained with another 3 modules to form a 4 module Scrolling Text Display. 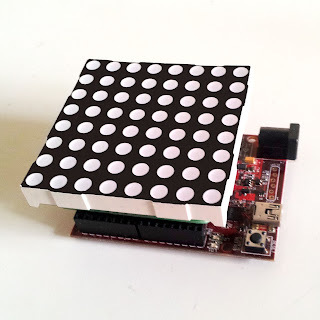 Visit the link below for a sketch to scroll text message on the LED Matrix Driver Module mounted on an Arduino board. *** Note that the pins used for DIN, CLK and LOAD in this sketch is different from that used in the 7 Bi-color LED Matrix scrolling text display example.